Rainbow Dash is set to compete in Cloudsdale’s Best Young Flyer’s Competition, but is a bit less secure in her ability to perform well for it than she appears on the surface. Her friends make an effort to get themselves to Cloudsdale for the competition to cheer her on, but the attention Rarity gets for the wings Twilight gave her to let her attend quickly go to her head, and Rainbow finds extra competition rather than support from her friend. 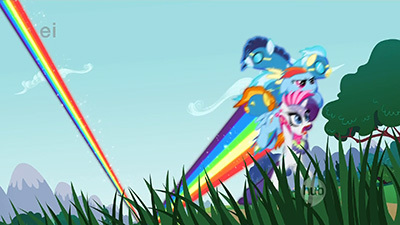 This is the episode that made me actually like Rainbow Dash. I’ve alluded to it in previous write-ups without actually saying it outright, but Rainbow took the “pony I need time to warm up to” slot for me when I initially started watching the series (everyone seems to have at least one character they don’t like out of the gate, and most often from my experience talking to people that seems to have been Rarity, although some very wrong people have named Pinkie or even Fluttershy as the one they felt distaste for and had to get used to). I’m not sure I can even really put my finger on exactly why, but right out of the gate from the first episode I didn’t particularly care for her. In part, I think it had something to do with her arrogant “I’m better than everyone here” (and yet I’m obsessed with Trixie, don’t ask me to explain that one) attitude coupled with the vague “informed awesomeness” character trait that put me off, and so having an episode that is laser-focused in on her insecurities goes a long way towards justifying her as a character for me. To be sure, it’s not hard to peg Rainbow Dash as being at least a little insecure (someone who goes around constantly reminding others of how great they are is almost definitely compensating for something, and poor actual self esteem under the mask of arrogance is usually the culprit), but this episode blows her mask clean off, revealing her to quite possibly be the most insecure character out of the group (Pinkie is likely either tied for first or in a close second behind her, which we’ll eventually get into a lot more, with the much more obvious Fluttershy actually in all likelihood being in the middle of the pack as opposed to the forefront). Actually having it taken out of subtext and put forward as a very clear, very real thing made Rainbow Dash much more tolerable to me, as it brought her down significantly and put her in terms that I could very much understand and relate to. We actually get quite a bit of insight into Rainbow’s past (and a bit into Fluttershy’s) also, as half of the episode takes place in Cloudsdale, her hometown. There’s a very strong implication that gets sort of spoken but not explained completely that Dash likely had some level of trouble finishing school. Dumb-Bell, one of the three bully ponies that Dash appears to have a history with, seemingly misrepresents what happened but we don’t know to what extent, and there’s something of a contradiction within Dash’s past, in that she seemingly was something of a child prodigy in certain ways (pulling off something considered impossible to do to the point of being legend when she was young), and yet she decidedly didn’t move on to any particularly impressive job within what’s arguably the Pegasus capital city of Equestria, instead moving to a small town and working weather duty (and often putting forth what seems like the minimum amount of effort she actually needs to do her job). It’s not for a lack of ambition, as Rainbow has that in spades with her dreams of joining the elite team of fliers in Equestria, so the suggestion is that something else went awry that caused her to have to change course at some point. Whatever it was that happened, it’s clearly a sore spot with her after all this time, and I wonder if possibly her goals and drive to be considered great all around is fueled by an awkward mix of success and failure within her childhood. Cloudsdale itself is a really cool place to get to see (especially as we’ve largely stuck to Ponyville and the immediate areas around it up until now). Where Canterlot has a much higher unicorn population, and Ponyville was founded by Earth Ponies and still takes its traditions from its origins as a town mostly populated by them (even though by this point they’re much more diverse), Cloudsdale is an exclusively pegasus city by the very nature of what it is, being both built on clouds which (normally) only pegasi can walk on, as well as being so high in the air that only pegasi can reach it anyways. The city’s built in a way that makes sense for being populated with creatures that can both fly and walk, as the bulk of the city rests within larger groupings of clouds and connected by roads and stairways, and yet there’s also buildings just hanging there on smaller clouds with no actual connection to the central hub of the city, which would only be accessible by flying. The buildings themselves are also largely wide open with very little in the way of enclosed spaces, giving the inhabitants the option to just take off and fly out of the walls or ceiling (it’s possible this is why Dash seems to have a tendency to accidentally crash through walls and ceilings occasionally, she likely grew up with the concept of enclosed spaces just not being a thing). The weather factory is a really cool concept, building even more on the idea that the pegasi as a race are concerned with the weather. And then there’s Rarity, who sort of slingshots from initially being the most sympathetic with Rainbow’s cause to actively hurting it. She’s not the main antagonist of the episode (arguably Rainbow’s internal struggle takes that role), but she certainly cements herself as the secondary one. It’s cushioned somewhat by her being so concerned for her friend at the start, as she’s the one who pushes Twilight to find a way to get them to the competition to help cheer on Rainbow Dash as well as putting herself forward as the volunteer for Twilight trying out a spell that she’s not at all confident about performing (I love the hesitant “having second thoughts” look Rarity gets halfway through Twilight’s spell. Also apparently Twilight had a spell for creating Flutter Ponies just lying around), and she certainly starts out with her heart in the right place, but it goes horribly awry as she simply can’t deal with the attention she starts getting for her new wings, and seems to forget rather quickly that they came to Cloudsdale for Rainbow Dash’s sake, and the entire thing becomes more and more about her, to the point of eventually joining the competition herself to upstage the very pony she originally was so worried about helping. It’s an exceedingly unlikable moment for her, and it’s one of her weakest traits shining through, but it’s also an interesting look at two ponies and how they’re both very similar as well as very different. Both Rarity and Rainbow Dash at their core crave the attention and recognition they think they deserve, and yet both of them deal with the situation they’re given in very different ways. Where Rainbow Dash is lacking confidence and starts panicking when she thinks she might not be able to live up to the picture of herself that she’s painted, Rarity’s issues lie in completely different places (as we’ve seen before, she falls apart under the pressure of doing too much and loss of control over her vision, neither of which are particularly tied to her confidence in anything she does). When Rainbow Dash is offered the chance to step into the spotlight and show off what she’s normally all too happy to boast about, she second guesses herself to the point of completely breaking down and cowering in a corner, while Rarity is all too eager to gobble up the attention, even to the point of stealing it away from Dash as the two have to share their performance time together. We’ve never seen the two clash like this largely because their fields of work are so far apart from one another, but by circumstance here they get thrown into the same arena. As a few final thoughts, Pinkie is two for two for finding books that Twilight is looking for instantly. The matter of fact way in which she explains that it was the book that landed on her face is just great, and also is more evidence towards the idea that she really does pay attention to everything going on around her, as she actually read the pages of the book that she wound up directly under and was able to immediately pick it back out of the pile again when she needed to. There’s actually a pretty decent argument in there for Twilight to hire her for helping to catalog and organize the library on a more regular basis. 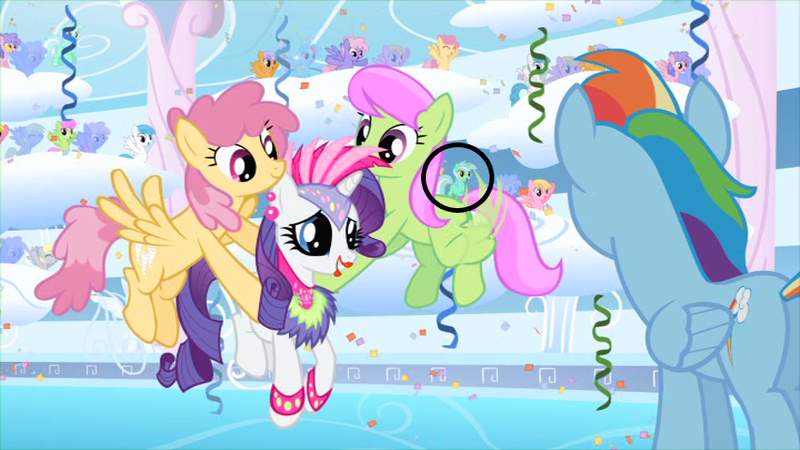 And what the hay is Lyra doing in the audience here? I guess Twilight’s not the only one who found that “walk on clouds” spell. Or had the means to get up there. 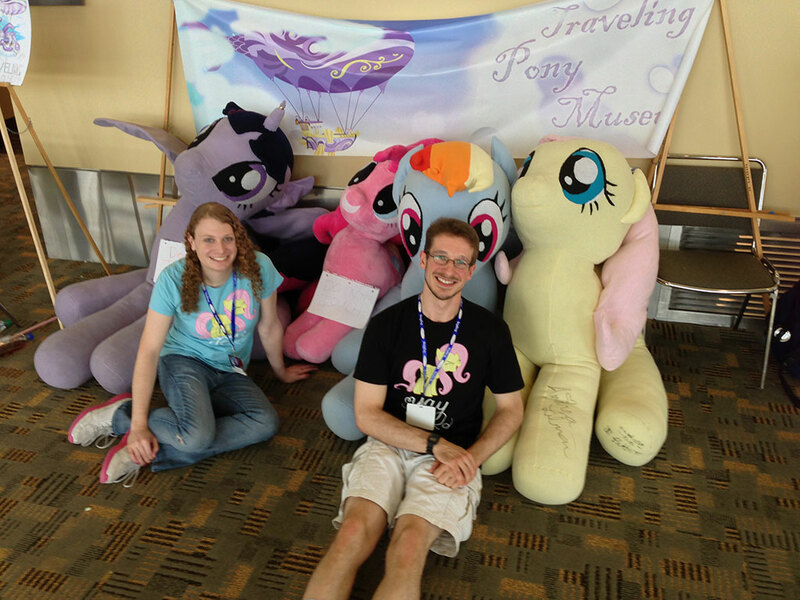 …Also, exactly where did Pinkie get that foam hand? This is one of my personal favorite episodes to show a newcomer to the series, as I think it hits all the right notes: complex character development and interaction, expansion of Equestian lore, humor, suspense, mind-bending physics, and the genesis of several enduring MLP:FiM memes, all without requiring much (if any) previous knowledge of previous episodes (though, as always, the more background the better). Oh, and Fluttershy being Celestia-tier adorable. 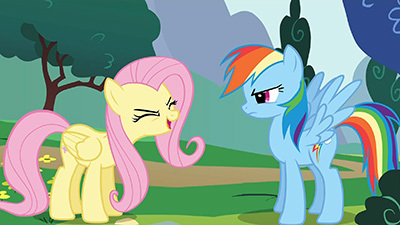 “Yay” is arguably the best of Fluttershy’s monosyllabic quotes, which also include “Um…”, “Eek!”, and “But..!” Right from the get-go of the episode, Fluttershy’s adorableness factor quintuples and “Yay” becomes a staple of modern reality: cell phone message ringtones, Ponyhoof notification sounds, t-shirt designs (one such design demonstrated by Tessa and me at BronyCon 2013), foul language censors (replace your cussing with “Yay” and tell me you don’t feel adorable), a replacement to Fus Ro Dah, Trotmania judgments, and a sample used in a gigazillion songs. With one word, Best Pony changed the world. She didn’t stop there, though: “You rock! Woo hoo!” is now more or less Andrea Libman’s go-to Fluttershy phrase at conventions, and while it never quite reached meme status, “Were we arguing? I’m sorry,” will forever warm my heart. Ahem, anyway, back to this excellent episode. Like Tessa, I’ve always had trouble liking Rainbow Dash as a character due to her insufferable arrogance. And while this episode did help to show that she had some complex depth to her character behind all that armor, it wasn’t the AHA! kind of revelation I got in Suited for Success with Rarity. Now that I think of it, I don’t think I’ve had that kind of moment with Rainbow yet… she just worked her way past “tolerable” and into “likable” in a very slow and discreet manner, which is quite un-Rainbow if you ask me. 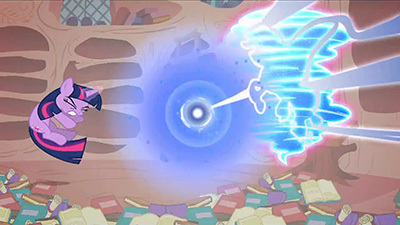 The little bits of lore sprinkled throughout this episode are just wonderful: pegasi’s ability to walk on clouds (and others’ marked inability to do so, except for Lyra it seems; I also noticed her this time around after having missed her every single time prior), the magical workarounds to said aforementioned problem, the history of the Sonic Rainboom (which everypony knows Rainbow Dash did once but has never seen since), the weather factory, rainbows being spicy, the annual Best Young Flyer competition… all great stuff. Cloudsdale itself also brings back some fond memories of an old dream I had where I was in a city in the clouds that was made out of clouds itself (just like Cloudsdale), and there were people walking around with leafblower-like devices that sucked up excess cloud chunks (rather than blowing them away) to keep everything tidy. As much as I like Ponyville, it’s great to branch out into other locales and see the world of Equestria and how the different ponies live in them. Back to Rainbow Dash a bit: it’s interesting how bent out of shape she gets about her wings when Rarity begins showing off her magical set. Rainbow’s wings are arguably her strongest asset and second in recognizability only to her rainbow mane, and she’s got to be terribly proud of them. And then her friend’s temporary wings drive her into a tizzy. I suppose I can see where she’s coming from, though: she’s spent her whole life working on her wings to try and catch the Wonderbolts’ eye, and yet here comes Rarity catching everypony’s eye without even trying. That said, a new kid on the block (or, in this case, a good friend) with a snazzy set of wings but no real skill using them shouldn’t really bother someone who is truly confident in her own abilities, which only furthers what Tessa was mentioning above: Rainbow Dash is quite possibly the most insecure of the Mane Six, but doesn’t often come off as such because she can cover it all up with her attitude. 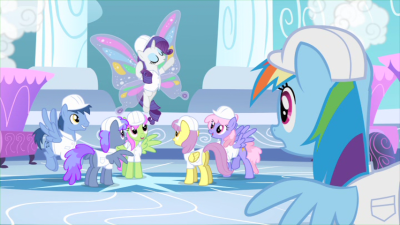 Which isn’t to say Rarity’s “beginner’s luck” with her wings isn’t entirely unfounded: she’s not a pegasus, so she has no inbuilt muscle memory to hold her back from coming up with some new, unique, and quite interesting flying/dancing (flancing?) moves. It would be like if someone came up to me and showed me an entirely different way of playing In The Groove: I’d certainly be impressed regardless of how skilled this person was. Rarity was quite the jerk in the process, though… but that’s her dark side: the side of her that turns into a black hole of attention that drags everypony within her event horizon down with her. Hah, contextually relevant metaphor for what happens next! We’ve had our friends here in mortal danger before: Pinkie almost got pulverized by a hydra in Feeling Pinkie Keen, Trixie barely escaped being smashed by an ursa minor in Boast Busters, and everypony minus Fluttershy would certainly have been vaporized had that dragon blasted them all with fire rather than smoke in Dragonshy. It seems Ponyville can’t go a day without some sort of this-should-totally-be-fatal catastrophe. So Rarity nearly falling to her death shouldn’t really be all that surprising, yet it is… and powerfully so. I think it’s because, whereas the previous near-death experiences were practically blink-and-you-miss-them things, this one is not: everypony is frozen in shock as the realization of what’s going on sinks in, and the ponies most capable of saving her (save the Princess, of course) fail to do so and nearly become victims of Rarity’s vanity themselves. And so it’s up to Rainbow Dash to do what she absolutely fears she can’t do to save her friend (and her role models, for that matter). And had she not been able to pull it off? Well, she would have become a crater in the ground, too. Seriously, the scene when the rainboom goes off and she pulls a 90-degree direction change at the speed of sound sends shivers down my spine. Sweet Celestia. It’s also probably spine-chilling for me because I have a mild fear of heights, so death by falling from the sky pricks me in the scarybone. Anyhow, very enjoyable episode in my books, and, so far as I can tell, enjoyable in the books of those I’ve introduced the show to by means of this episode. Then there’s No. 15 by Kreühn Pöny, which is a very different kind of song altogether. Perhaps an alternate future where the Best Young Flier competition is actually a showcase of avant garde musicians? Oh, and I would be absolutely remiss if I didn’t include at least one “Yay” song, so have Avast Fluttershy’s Remix by TheRaider310. If you need some super-energetic electronic pony music with one of the absolute sickest drops this side of Cloudsdale, blast this one out your speakers with your windows open! What I love most about this episode is the evolution of the plotline. First it seems like an Odd Couple pairing of the loudest of the Mane Six, Rainbow Dash, being stuck with the quietest, Fluttershy, as the sole member of her cheering section at the upcoming competition. Then it becomes a reveling character study of Rainbow’s lectures to Fluttershy about confidence and assertiveness actually being a projection of Rainbow’s own crippling insecurities. Then it becomes Rarity rallying the others to go after and support their friend through whatever magical needs are necessary. Then about Rarity flying her head straight up her haunch as she gets so caught up in the attention she’s getting that she loops us right back to the initial setup through Rainbow being pushed deeper and deeper into her hole of anxiety and depression. I don’t know that I’d rank who’s been the most insecure, as we’re seeing them all laid pretty bare at various points in the series, but this is certainly striking given how opposite Rainbow’s reality is to the facade she often wears. And even then, a large part of it is her coming home and dreading the need to live up to expectations from a past action that not even everyone here believes actually happened. It’s not so much that this is how she really is, as it is her facing certain lies she’s built around herself. As Gerf mentioned above, instead of falling into a position of prominence where she’ll have to face expectations of excellence on a regular basis, she’s instead gone off to a quiet job she’s wildly over-qualified for, and while this does allow her to always excel at it and fuel her boasting, it also leaves her restless in constant search of other things to challenge and occupy her. And it’s not that she’s been running away from her past excellence, as she really does want to recapture it and does want to show her peers just what she’s capable of, but she’s spent so much time slacking away from it that she’s worried what it’ll mean if she’s no longer capable of pulling off such feats. So she wants this, she really really wants this, but she’s terrified of what will happen and where she’ll go from here if she isn’t able to get it. That’s an incredibly complex psychology to explore in a children’s show, and cudos to Mitch Larson for following up on the screwball classic that was “Swarm of the Century” with such a rich character piece. Which isn’t to say that was lacking in character, nor that this is lacking in hilarious antics and setpieces, but he’s showing a great range and depth to himself as a writer that will not only spark my excitement every time his name hits these credits, but has me curious to start digging into his other work. I also love how Rarity’s arc is handled. Yes, we do see her at her absolute worst here as she becomes this increasingly garish tribute to her own vanity, but it’s important that we also saw her at her best, that she was the one who fought for Rainbow Dash and was willing to sacrifice herself to further her support, only for the results to backfire and sweep her away with Teh Pretties, up to the point where they’re ash and she’s flailing to her doom. I’m really glad that she was the one giving the lesson on friendship to Princess Celestia. That’s was a wonderful touch. Also, I like that they stick to the fact that she didn’t get the same spell that allowed her to walk on clouds and that Twilight probably couldn’t perform it again without the book that’s sitting back home. After Rarity is rescued, she’s held aloft by a pair of pegasi, then we just see her sitting in the balloon waiting for the others. I can see why this would work as a good intro point to the series, but I like that I’ve had the build of getting to know the boastful side of Rainbow first before having the mask suddenly pulled away. Also, the revelation of how weather is devised and all that again builds on things we’ve already seen. So while I don’t think it’s a bad intro episode, I don’t know that it would be my first pick as you shouldn’t always jump to the punchline without getting the setup. As for the characters, honestly, the only one I still haven’t warmed to yet is Twilight. Part of that is her being the audience proxy, the outside observer, and while we have gotten lessons involving her, they feel more like they’re steered around the moral, whereas episodes like this one feel like they anchor on the character and are just building from there. The pony I actually have the most problem with is Rarity, but that’s just by the nature of her vanity, which is a very real part of her and episodes like this address and explore, so at least she’s fleshed out as an individual. Twilight, though, I still haven’t quite figured her character out, and part of that may be because of the shift post-pilot, where instead of building on what was first established, they’re instead backing away and trying to find something else, which they haven’t quite pinned down yet. We’ll see. Overall, though, a great episode. Great animation, great plot and character work, great worldbuilding. An all around fine show.